These bed sheets are truly defining the meaning of shades of paradise. Having a paradise like charm, these sheets have enthralled everyone. With its not so common color, it will make you stand out of the league. Your lifestyle tells everything about your personality. Make your life unique with fascinating and attractive colors and filling them with exquisite pattern and designs. You can make your lifestyle much more attractive and fascinating for others, if you bring a little change in it. Everyone will admire you about your choice and thinking. You can set an example for others that how a perfect home should be. Just go through the look of your old bed as they are going to replace with some modern and designer covers. The time has come to an end for them. Develop your home decor with grace and elegance and buy mystic blue bed sheets from our online shopping portal swayamindia.com. Let the chocolate fantasy take you into the warm oceans of indulgence. Presenting herewith Chocolate Baroque Bed Sheet, a designer printed cotton product. The beautiful motif in the design gives it an edge. If you like to flaunt all big, you can go for this Yellow Passion Bed Sheet. Printed with big leaves in the centre and plain at the sides. This Bed sheet is a big compliment to the décor. This pure cotton bed sheet is a value for money product. Go classy with this Cream ‘n’ Pink Bed Sheet. The cream base gives a pristine look to the product. There are big pink flowers above that counting for a perfectly adorable look. 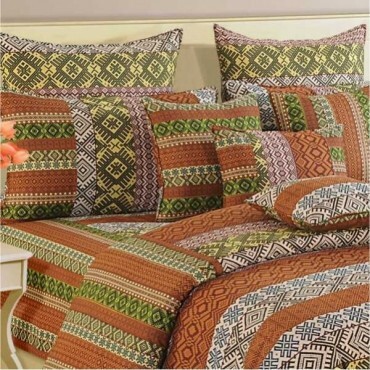 This chic bed sheet goes well with contemporary and ethnic set-ups as well. 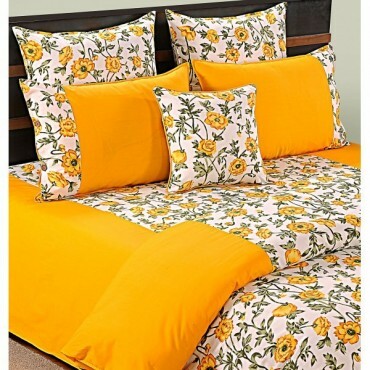 Welcome brightness with innovative expression through this Yellow Flowers Bed Sheet. With the usage of green and yellow colors, you can turn your home into a blissful abode. 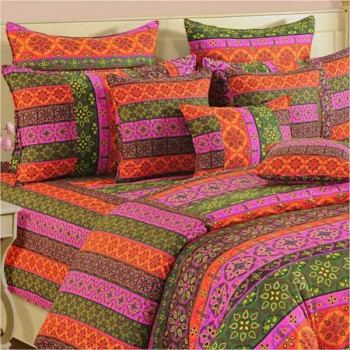 As the name suggests, this bed sheet will truly splash its beautiful colors and designs all over your bedroom. If you want to live with the colors and with amazing artwork, then here is the chance to make this dream come true. Buy design splash bed sheets from our online shopping portal swayamindia.com and feel the lavish change. If we can see the luxury then this bed sheet is exactly showcasing the image of luxury. With their vivid color combination, they will take you to the world of dreams. They have such a royal and classy look that will turn your home into a palace. Let your body fall into the sea of tranquility. Bring the fragrance of the rose, this French rose color can make anyone’s day special and full of freshness. You can bring elegance to your home decor by just covering your bed with this beautiful color bed cover. You can completely change the appearance of your home by just bring a little change to your living space. Who says only black & white is a hit? 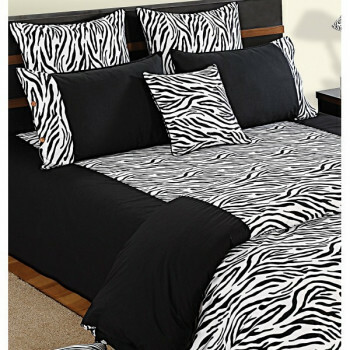 Try this Black Desire Bed Sheet which is a great combination of cream & black. 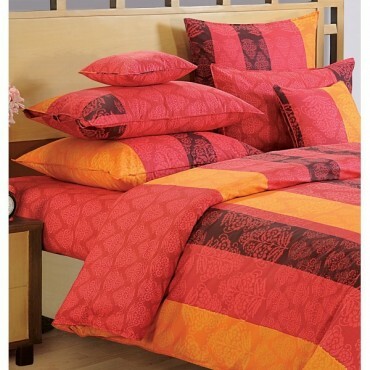 The interesting design as well as the complementing colors is an add-on to this beautiful bed sheet. If you have a taste for design, then this Pink Motif Bed Sheet is an ultimate gift from the house of Swayam. Our team has put in this interesting design in place to satisfy your excellent fetish. This bed sheet is 100% color fast and is made of premium cotton. A heart throbbing chill that went through the spine and give jitters that make you feel the real blue. 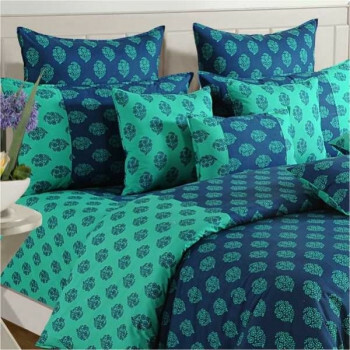 Yes, offering you yet another gift from the house of Swayam- Aqua Floral Bed Sheet. A lot is in store for you, once you experience this amazing premium cotton bed sheet. Get high with the sweet design of wine. This Wine Floral Bed Sheet by Swayam is a deal worth grabbing. The color is so pretty that you will glow when you lay down on this ultra soft premium cotton fabric. Make some room for the floral freshness. 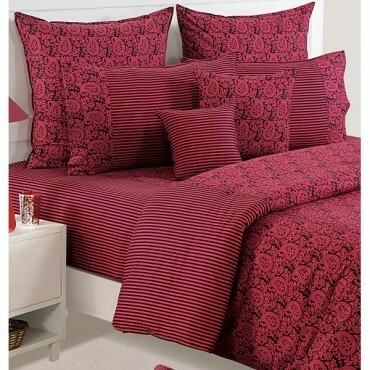 How amazing your milieu will turn by introducing this mesmerizingly charming Rose Pink Flowers Bed Sheet. Contemporary is the call of the day now. 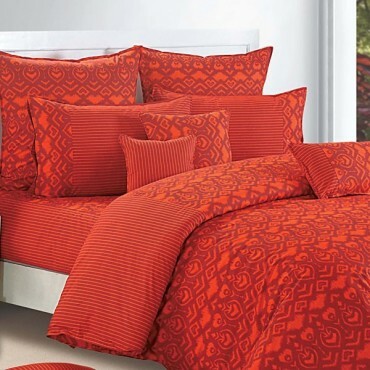 Clasp this offer and bring home the glory by Ikat Saffron Bed Sheet. This designer printed bed sheet is made up of premium cotton which is highly mercerized to render super-soft mushy feel. 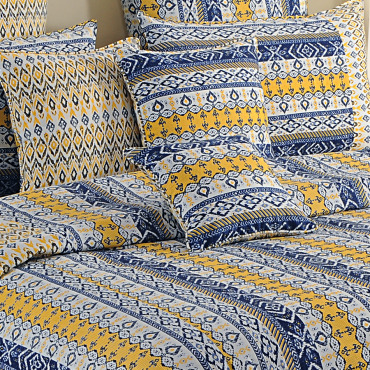 Buy ikat saffron bed sheet & pillow cover from our highly secured online shopping portal along with best deals and offers. Relax in your own whistling woods, your own personal sanctuary where you can move around with ease and comfort. Hop on for your private safari that will take you on an adventurous endeavor. Inspired from the wildlife of Havana, these linens will surely take you by a pleasant surprise. Move into the versatile abode and see your space coming alive with these wonderful linens. Give your space a vintage makeover, inspired to create something unique. A place that will give you personal space to get an escape where you can relax and rejuvenate, awaits you. You family is going to love the changed appearance of the old furniture. Proud to be an Indian? Express your love for the tradition and cultural ethics of this beautiful cosmopolitan country. 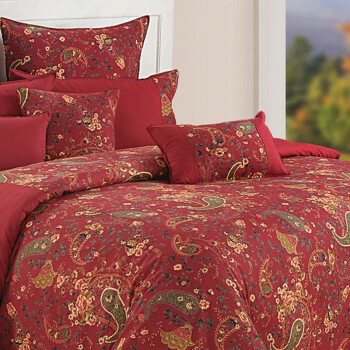 Presenting Maroon Paisley Indian Bed Sheet for the true Indian homes and hearts. Experience a stripo-floral combination. 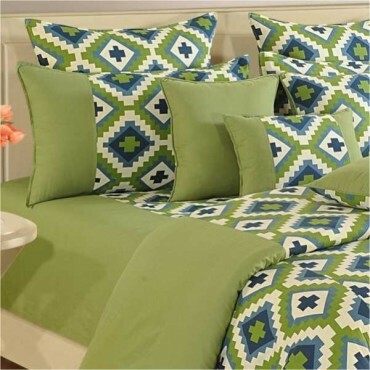 Swayam offers this enchanting Yellow Green Floral Bed Sheet to brighten the ambience. The lime effect creates a tangy and sweet look. Delve into the realistic flavor and modern touch being exhibited by this Blue Leaves Contemporary Bed Sheet. 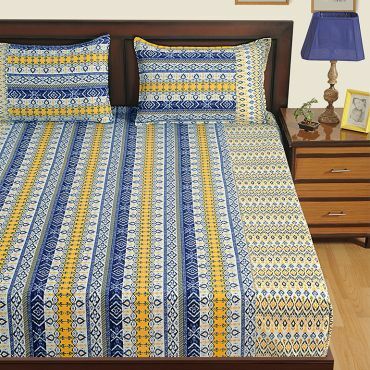 This 100% cotton printed bed sheet has a smooth and soft textured fabric that is skin friendly. This bed sheet comes with easy maintenance as another added advantage. 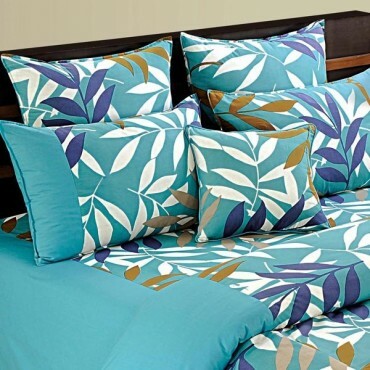 Bring home the ecstatic & electric fervor with this Blue Desire Bed Sheet. This premium cotton printed bed sheet has reactive prints which means it does not fade away on wash rather it becomes brighter. Like the creamy flow, this cream colored bed sheet will make your heart fly out of your body. Symbol of the high-class lifestyle, this color has always been in trend. The rich class people who want to show their classic lifestyle, instead of going for vibrant colors, choose this color of simplicity and calmness. Try an altogether fresher and breezier combo of brightness symbolizing depth of an ocean and beauty of fragrant flowers. Yes, you can very well see and feel this magic with this Blue Flowers Bed Sheet. This 100% color fast bed sheet carries easy maintenance and bright colors. 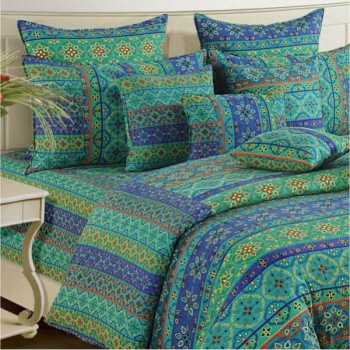 Bring ethno-modern traditionality in your set up with this Dark Turquoise Patterned Bed Sheet. 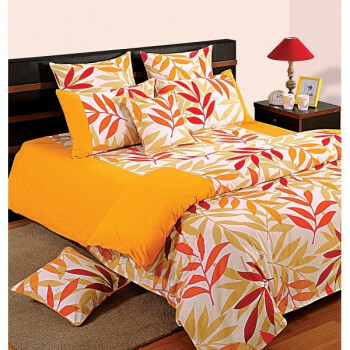 The printed bed sheet comes with pure cotton fabric and 100% color fastness feature. The bed sheet has yellow printed pattered on this making it attractive and appealing. Dance into the tunes of the interesting melody and make your room that orchestra you never want to wind up. 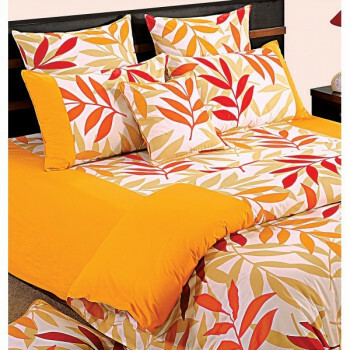 This Red & Yellow Medley Bed Sheet is made up of premium cotton. The mercerization process has given this bed sheet its soft and mushy texture and intrinsic brightness. Bring some cheer and energy to your home with fun filled lifestyle accessories in bright colors and patterns. Get a whiff of the spice of the freshness and beauty with the aromatic bed covers that can lighten up the mood of every home. Just feel the fresh aroma of the beautiful roses and bring romantic mood to your abode with these rose motifs bed sheets. Sometimes bold, sometimes subtle; at times striking, at times mild. Such are the patterns of the enticing floral and blissful prints created over the years for the Shades of Paradise Bed Sheets, double bed sheets collection of Swayam. Some of our 12 to 15 color discharge prints bring a delightful surprise on our customer’s faces as in our designs they find that next to impossible and unique appeal they have never found anywhere else. The use of hundreds of colors through the reactive prints, Prussian and pigment rotary techniques on high thread count mercerized cottons, we at Swayam have been able to create the ‘paradise on earth’, which you can take home and create your own personal blissful abode. These double Bed Sheet or bed linen sets have been made up of pure cotton which makes them skin friendly, thereby giving them dual advantage of quality and style. When colors splash into vivid trends, a harmony of different hues is created, and then what comes into being is a saga of alluring patterns- the saga that is bright and innovative expression called ‘Shades of Paradise’. Our Shades of Paradise bed sheets are printed in various cities in Rajasthan, Gujarat, UP and Delhi. These beautiful bed sheets are the outcome of great efforts of our team and their creative minds. You can buy shades of paradise bed sheets online at Swayam India at discounted price by exploring profound options.